Last week was Grandparents Day at school. Every year the kids get to make a cake for a cake auction! This year we chose to make a cookie cake! It was super easy. 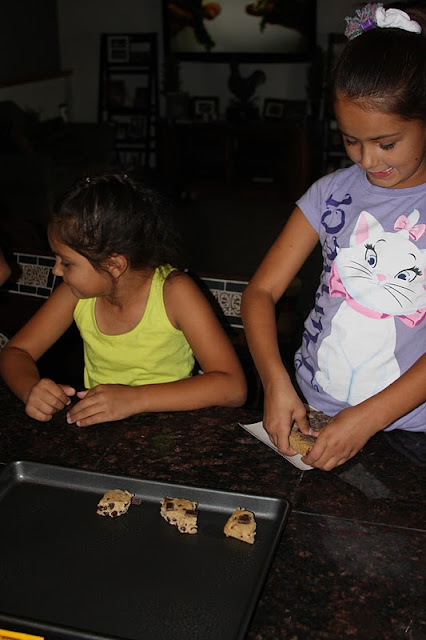 Let the kids place all the cookies on the baking sheet. Cook according to the package but keep cookies soft. You don't want to have a hard cookie cake. While the cookies are baking, get your food coloring and color the frosting. We just added the food coloring straight to the containers and let the kids use a butter knife to stir. They loved watching the color change and made knew when to add more food coloring to get the frosting darker. Look at how pretty the colors turned out! Once the cookies are done. Immediately add some mnm's to the tops as they cool. The candy coating will melt just enough to help stick to the cookie. After your cookies cool, its time to get stacking your cake. The really fun part for all the kids. ;0) Stack the first layer, add frosting. Stack again, add frosting using a different color frosting each time. Keep stacking until you are out of cookies and frosting. Now don't get crazy and make a huge leaning tower. HA HA Add some mnm's to the top to finish off your cookie cake. The kids added the rest of the frosting to the bottom around the cake and stuck mnm's to it. I thought it was a great idea. Turned out so cute! The kids had so much fun making this cookie cake. They were also very happy that we won the silent auction to take our cake back home. ;0) As soon as we got it home, we all had a taste. I don't like cake but love cookies and frosting, so this was heaven for me. We all loved it! It is very sweet, so I recommend small amounts. Here are some more pics of the finished cake. Now go make one for your family and enjoy it! I am definitely going to make this cookie cake again!